It’s the first distro that every time I reboot, I can access Windows shares with no problems. On the flip side, with Mint, I REALLY like the fact that practically every little utility or program I was looking for had a .deb file for easy installation. With Antergos, I once needed something that wasn’t in any repository (or at least not that I could tell) and somebody put together an Arch version of it but it involved using mkfile? pkgbuild? and yeah… never got it to working and I think I have parts of it scattered across my system now. Being a n00b and all, this will happen. I also don’t like that in Antergos, I can’t use VLC to watch videos because if I drag the slider to scrub and let go of it, I get garbled video for a few seconds and then it plays. No such problems with MPV. Since it seemed to be a problem with VLC, I posted in their forums but I was asked to check things I have no idea how to so I put that issue on hold for a while. @joekamprad sudo pacman -Syu got the updates flowing again, thanks! i use sabnzb and sonarr work great on antergos. never had any luck with nzbget. Don’t mess with any Sonarr settings. Leave it running under the ‘sonarr’ user account. Make sure to add sonarr to the groups ‘users’ AND ‘wheel’! Stop NZBGet (if it’s running!) and edit /lib/systemd/system/nzbget.service. Change user and group to your account and the group that you’re in. Make sure all accounts are added to each others’ groups. (add your account to wheel, plex, nzbget, sonarr)… nzbget to users, plex, sonarr, wheel, etc., etc. 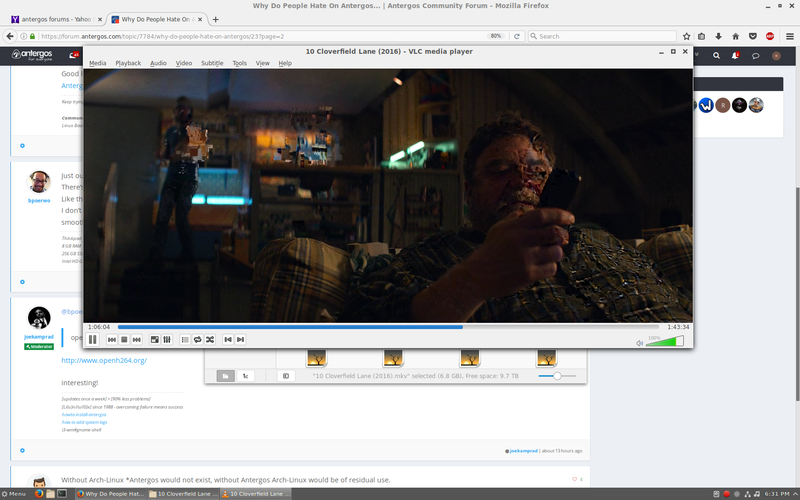 Right now, sonarr has NZBGet grab the files, sonarr can rename and import them and plex can see things just fine. Everything is finally working together in perfect harmony! Side question…I’m painfully aware of how much Linux LOVES file permissions… as I switch over to Antergos from Mint, will I need to do anything special to my movies/tv folders? In Windows, when you hook up a new data drive, you sometimes have to take ownership of the folders/files. Will it be the same with switching distros? Will I have to go into the folders (once the mdadm RAID 6 array is assembled) and go into the properties of these folders and do anything? I don’t see 6.0.4-2 anywhere. @joekamprad Still having the problem but I found a work around. When I clicked on the little magnifying glass (or something) and got to the “smb:///” box. I entered smb:///my server ip/d$/, (or maybe I removed one of the three slashes after smb?!) and I got prompted to enter my password to unlock the key ring. I did that and got an error about unable to mount the location. Then, I just removed the trailing slash and left it: /d$ and hit enter and my share drive popped up perfectly. With this work around, I’m happy. Weird but it’s working. Good news, I think newer Nvidia drivers have corrected the problem… so long as I use the ‘X11 Video Output XCB’ option. I know for a fact I tried ALL the different video outputs months ago when I first experienced the problem but now, using that output, no more slow seeking. I saw there was a recent Nvidia driver update so I tried again, and cycled through the video output options and BINGO! Since the problem was isolated to VLC, I didn’t bother asking for help here as it didn’t look like Antergos had anything to do with it as I’ve seen this problem more than once (especially when using the Nvidia proprietary drivers) across several distros. I could start a topic here in the forums, so we don’t pollute this thread, if you’d like to dig into it. I just couldn’t figure out how to get this working because of my n00bness. @Velkerk Yup, I quickly found MPV after I couldn’t fix the VLC issue. The ONLY reason I prefer VLC is because sometimes I’ll need to make audio delay adjustments to the MKV file after I rip something. I use VLC to find the perfect delay then use another program to make the offset permanent in the MKV. VLC allows for adjusting audio delay by 50ms increments and MPV only goes down to 100ms. If there was a way to have MPV allow 50ms adjustments, I could leave VLC in the rear view mirror and not worry about it.